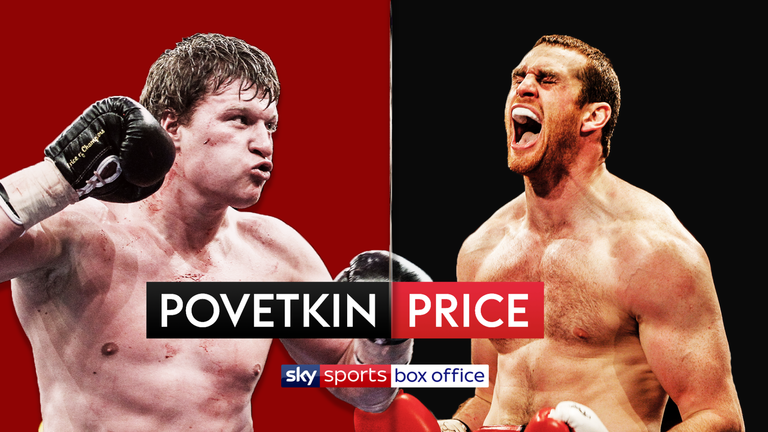 Alexander Povetkin will defend his WBA Inter-Continental and WBO International Heavyweight titles against David Price at Principality Stadium in Cardiff on March 31, live on Sky Sports Box Office. Former WBA ruler Povetkin is the mandatory challenger for the WBA Super title held by Anthony Joshua MBE, who meets Joseph Parker in a unification blockbuster at the top of the bill. The Russian powerhouse will be targeting a showdown with the main event winner, but must first make a second successful defence of his titles having seen off Christian Hammer in December after winning the belts in July against Andriy Rudenko. Price has other ideas as he lands a golden opportunity to take a seat at the top table in the Heavyweight division. The Liverpool favourite returned to action in December in Essex after his loss to Hammer in February, and the 34 year old is determined to take this golden chance on a ‘life changing’ night. “It is a massive, massive chance for me and it has come from nowhere,” said Price. “I wasn’t expecting an opportunity like this to appear so it was a no-brainer. “It is a big ask for me to go out and win this fight but upsets do happen in sport. I have been on the wrong end of upsets in boxing and I think I am due a bit of luck. I have a belief that this fight has come at the right time for me and I have a belief that I am going to win the fight. “Without doing myself a disservice, every dog has its day and I have a feeling that this is doing to be my day and everything that has happened has led to this. “I have never found myself in this position where I have been the big underdog and I have everything to gain. I will go in there completely free of any pressure and I think people will see the best of me for that very reason. “Make no mistake, I am coming to win. At first, I was just grateful for the opportunity but now in my mind I have to win this fight. There is plenty to gain and too much upside for me not to win this fight – it could be life changing. I am desperate to win this fight and I will do everything in my power to do so. “I know it will be a hard fight, anything can happen in a fight and I may have to get off the floor to win. It is going to be the hardest fight of my life but something is telling me it is going to be my night. “Sparring will be key for me. I am going to have to take myself out of my comfort zone when it comes to sparring for this fight. I need to bring in world-class sparring partners who will test me every day. We will go away to Germany for some sparring, we haven’t got any names yet but we are having a look. Povetkin and Price clash on a huge night of boxing in Cardiff as Joshua and Parker battle for the IBF, WBA Super, IBO and WBO World titles.